Across the country, outdoor summer film festivals offer plenty of entertainment, food, and community togetherness. So what better way to spend the summer than by visiting a few of the largest outdoor film festivals here in Los Angeles? Here are six great festivals to catch a movie at this summer. 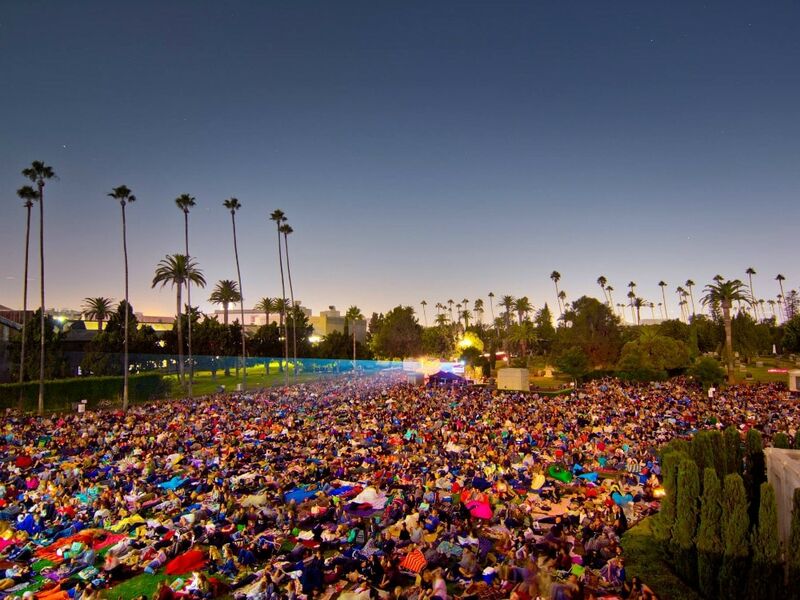 Made famous by the movie Valentine’s Day, Cinespia hosts movies at the Hollywood Forever Cemetery. This year’s crop includes July 3rd and 4th movies and fireworks—Footloose and Thelma and Louise, respectively. Other film screenings later in July include Austin Powers: International Man of Mystery and The Graduate. Tickets run $12 to $20. 6000 Santa Monica Blvd. With two different locations at Level in Downtown LA and Neuehouse, the Rooftop Cinema Club shows both classic and new movies throughout the summer. The smattering of films played at the Level location include Baby Driver, Top Gun, Mulholland Drive and Mean Girls—and that’s just June’s offerings. For Neuehouse, expect to see Rebel Without a Cause, Pretty Woman, Black Panther, and The Bodyguard. The Level location is for ages 18+ and Neuehouse is 21 and over. Level, 888 S. Olive St.; Neuehouse, 6121 Sunset Blvd. Street Food Cinema is an outdoor movie festival that goes all the way through October. In addition to movies, there’s also gourmet street food and music. Movies coming up in July include Grease and Space Jam and in August expect to see films such as The Lion King and Mamma Mia (celebrating its 10th anniversary). For food, guests will see falafel, barbecue, and Korean food. Click here for locations. 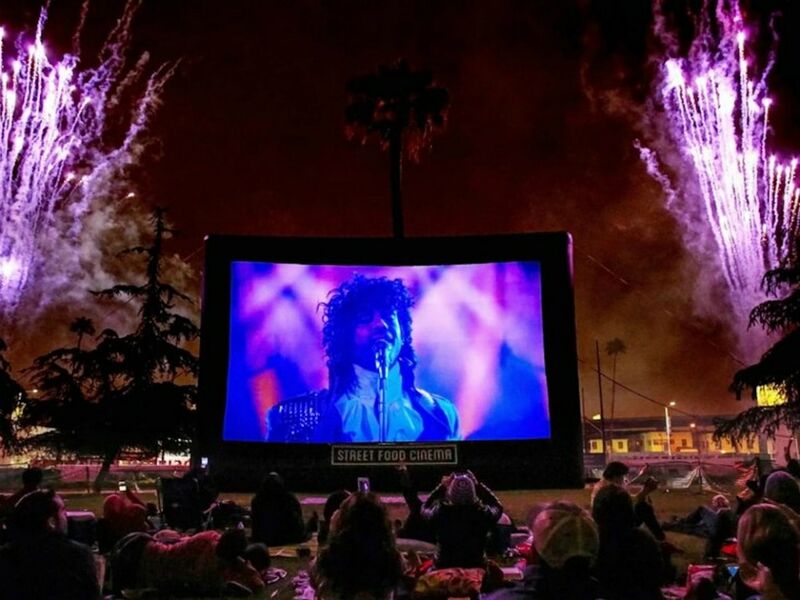 LA’s original traveling outdoor movie series also includes food and music. Their unique lineup of movies (sponsored by Showtime) for every taste include Groundhog Day, Ocean’s Eleven and Back to the Future. For music playing at the series, bands like the funk and soul “Thumpasaurus” and electro-pop female fronted Karmic. The movies are shown on Saturday evenings at various locations around the city and they’re dog friendly too. Click here for locations. Head to the Tropicana Bar at the Roosevelt Hotel for classic LA movies every Tuesday from 8 p.m. to 11 p.m. There are movies for all ages—from Singin’ in the Rain, to Fast Times at Ridgemont High to Clueless. Cocktails are served during the movies, which are hosted by Seth Owen. 7000 Hollywood Blvd.